We use a variety of medias to blast with including sand, dry ice, and walnut shells. But why use soda? Prior to soda, sand was the main blasting media. Sandblasting, however, is abrasive and erodes the substrate coatings, pitting glass, tearing rubber, plastic and etching metals. Soda blasting can be used wet or dry to remove paint, corrosion, biological contaminants, oil, grease, carbon and many other coatings. – Sodium Bicarbonate is a non-hazardous food grade material that is 100% water soluble and environmentally safe. – Soda Blasting will eliminate the need of using toxic cleaning chemicals. – Soda Blasting will clean multilayered surfaces to any level desired. – Soda Blasting may be used to clean while machines and processes are in operation. 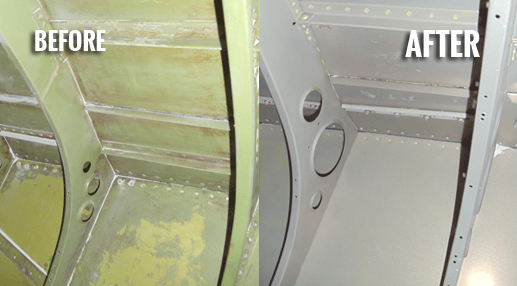 Another major advantage of soda blasting is rust elimination. Soda does not break down the surface tension of metals, thus the problem of flash rusting is eliminated. Sodium bicarbonate can act as a rust inhibitor, which will leave a protective coating on the surface being cleaned. This allows for time to pass before the surface has to be painted. This is unlike a sandblasted surface that must be painted immediately. When the time arrives to paint the surface, the protective coating (soda) can be removed by an application of a vinegar/water mixture. 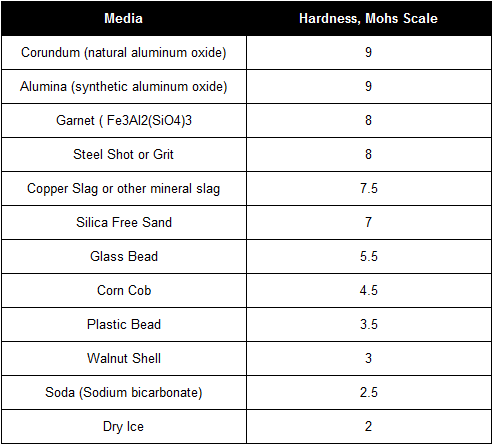 To fully appreciate the soft consistency of soda, the Mohs Scale is included below for your convenience. Hard abrasives seven and above on the Mohs scale (see below) mostly remain intact, therefore most of the force is directed into the substrate. Softer abrasives such as glass beads and soda crystals shatter on impact and part of the forces are directed in other directions as the particle “explodes” into finer fragments. Some of the fragments travel along the substrate perpendicular to the initial direction of impact. These fragments moving along the surface do a remarkable job of cleaning. Soda Blasting is the latest, greenest technology to safely strip paint and/or clean nearly any surface. Soda blasting is much kinder and gentler to the underlying surface and the environment. The process is gentle enough to remove the coating without harming the substrate. Virtually any coating can be removed from most any surface. Soda blast media is FDA approved, non-toxic, and contains no free silica; it is non-sparking, non-flammable, non-hazardous, and environmentally safe. Read more about soda blasting and see some of our projects here. What’s your next refinishing project? Let us know in the comments below! – When Do I Need a Professional Sandblaster? – When Do I Need a Professional Soda Blaster?